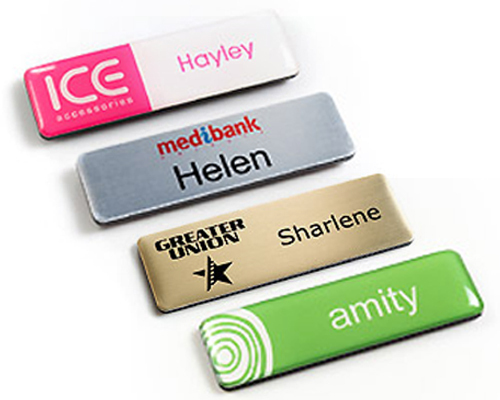 Used in many different aspects of business and community life, name badges provide a warm introduction and create a friendly working or sales environment. All prices below are for 76mm x 25mm size badges, an ideal size for name badges. Prices include artwork. Set up costs of $29.70 + GST and GST (10%) are additional. Rush orders may incur additional costs. Pricing above valid for 76mmx 25mm size badge with standard pin fastener. Other dimensions/size badges are available, at an additional cost. Please contact us for a quote. Delivery if required, is extra and charged at cost. Larger quantities are available, please contact us for our best prices. Above prices assume artwork will be supplied in correct format.